I’ve been meaning to try a 1×11 groupset for a while now but I’ve just been too cheap to spend my own money on one only to have it fail on me. Although you can throw a mega granny like the Sunrace 42T granny on a 10-speed setup, inevitably you always end up having issues with either your highest or your lowest gears. There are a bunch of workarounds for this like using a goat gear derailleur extender or swapping out your derailleur cage with one that has a wheel that can automatically move up and down based on what gear you’re in. 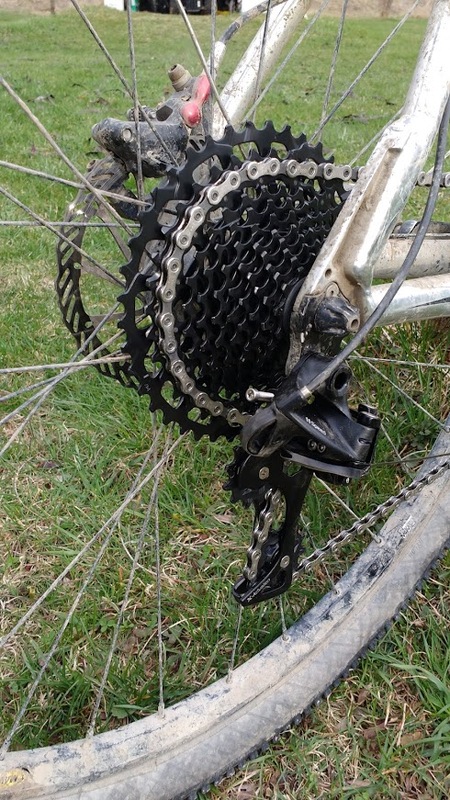 These derailleur extender and cage ‘fixes’ are far from elegant. With an X11 system, you have a derailleur that is designed to go from a 10T cog to a 50T cog and that will maintain the proper distance from the cogs throughout its entire range. This article is about 2 weeks of testing with a 2500W Ludicrous controller and a GX level groupset with an XG-1150 Cassette and how this setup exceeded my expectations on what kind of range was possible with a single derailleur. Almost all my ebikes are 10-speed setups. Although 8-speed chains are more durable, most 10-speed derailleurs are able to deal with a 36T granny without skipping issues. I have broken far more 10-speed chains than 8-speed chains and I don’t remember ever breaking a KMC single speed chain, the wider the chain is generally the more durable it is. I have been hesitant to test an 11-speed system because my fear is that it would be even more fragile than a 10sp setup. Steve Christini loaned me his AWD eFatbike for 2 weeks to thrash on and it came with an 11sp GX setup with a crazy 10-42T all steel cassette with hundreds of stainless steel pins. With high power ebikes, one of the main failure points is the cassette. 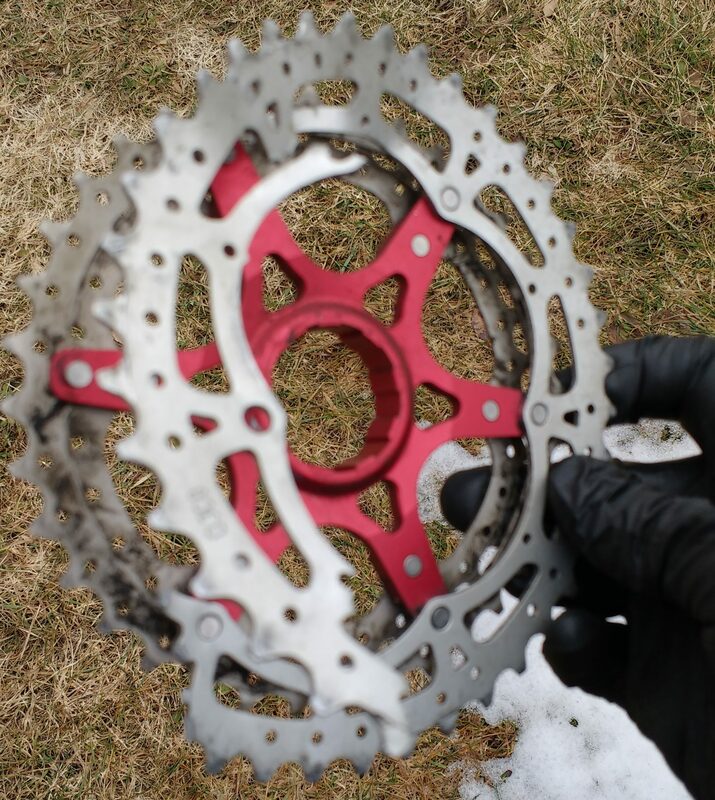 It is extremely unwise to ever run aluminum cogs in the rear, as the high power pull of the chain will often bend the chainrings, especially if it is under load while it is shifting. I have destroyed about 10 cassettes that were all steel along with every single aluminum geared cassette that I have ever tried. The XG-1150 cassette is something special because not only is it all-steel, it also has pins that tie the gears together out at the edge of the cassette instead of only around the hub. This makes a huge difference because that’s where all the force is pulling on the chain as these stainless pins keep the gears from warping or bending under load. 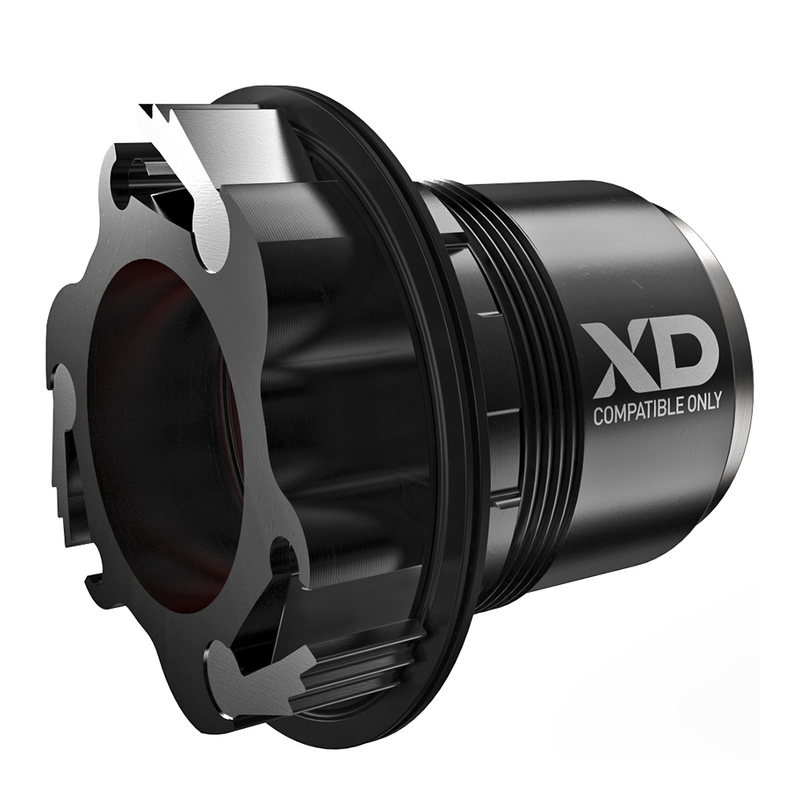 Unfortudently the XG-1150 is an XD Drive system which means it is not compatible with any non-XD drive freehubs on the market (your bike is probably not an XD-Drive). 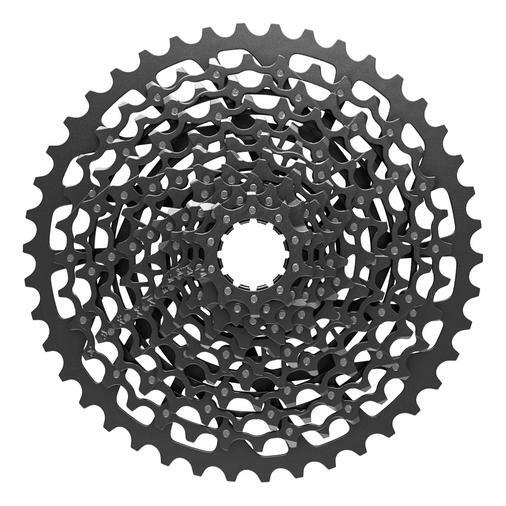 Another huge problem with many cassettes is that if the gears are separate they tend to eat into the freehub body, especially if it is aluminum. When you use a cassette that is a tied together ‘one piece’ cassette then the force is distributed over a larger area on the freehub body and you don’t get the individual gears eating their way through the freehub body. When I get a new bike I want to convert the first thing I do is pull off the cassette and see if it is a one piece or individual gears. If its individual gears and the freehub body is steel then I leave it alone. If it’s an aluminum freehub body and steel separate gears I swap it out with a CS-HG62 or something similar that is a steel one piece cassette. The XD drive cassette screws onto the freehub body like the older style freewheels and so these problems with eating away at the splines on the freehub body are not an issue at all. Aluminum freehub bodies also have the major problem where the steel pawls tend to eat into the freehub body on a high power ebike over time and will eventually fail. In general when shopping for a new bike you want to avoid the more expensive aluminum freehub bodies entirely and stick with steel if you can. If you are uncertain about the construction you can always use a magnet on the freehub body to see if it sticks, if it does then it is steel, if not it is aluminum. What if I don’t have an XD Drive cassette? The XG-1150 cassette will only work with an XD Drive cassette and will not work with a conventional freehub body. If you have a conventional cassette then you will have to opt for the PG-1130 which also has a 42T granny and is all steel. If you want all steel with a massive granny and a conventional freehub body there are two good options I could find, but both of them are non-name-brand cassettes so the quality might be sub-par. There is the 11-50T steel Sunshine cassette for $57 here and the 11-50T Bolany cassette for $58 here which is also all steel. My understanding from reviews is that the GX 11 speed derailleur will work with a 50T cassette on most bikes without a derailleur extender, but again I haven’t tested this setup so I can’t say for certain. Both of these 50T all steel cassettes are well over 600g, but the range you get from them will be absolutely insane. I’m not a fan of the XD Drive setup, as near as I can tell the only purpose is to add expense to your bike and it’s just one more standard that might end up being the new normal, or it might just peter out in a few years. The XD drive system does allow you to have a 10 tooth road gear (normal cassettes are limited to 11T) but other than that I don’t see any real benefit to using an XD drive freehub body. The GX shifter worked very well and the shifter ($38) derailleur ($91) combination is reasonably priced, unlike most 11 speed setups out there. The XG-1150 cassette runs about $99 (XD Drive freehub body), if you have a conventional cassette then the PG-1130 runs about $63 and a chain will run around $18 which means that for $246 (XD Drive) or $210 (conventional cassette) you can have a whole new 11-speed setup with a 42T granny that will work with all of the aftermarket BBSHD and BBS02 chainrings currently on the market. 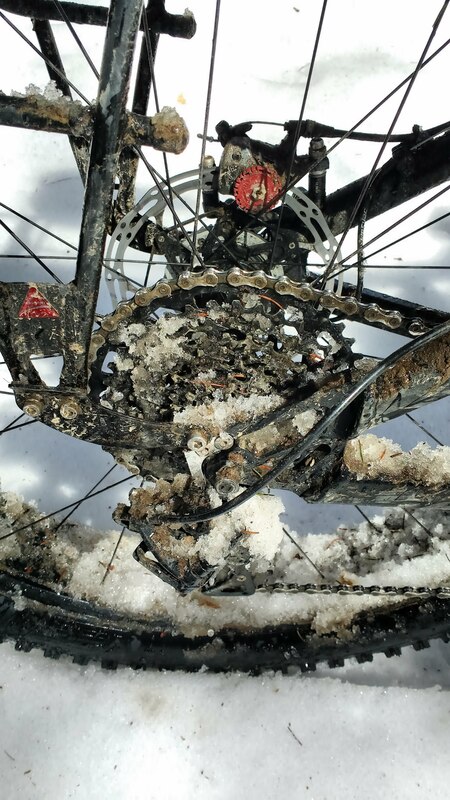 That is not necessarily true with 12-speed chains, or so I have heard, I haven’t tested a 12-speed setup yet with any of the aftermarket BBSxx chainrings. The range that using an 11-speed setup is more than you will ever be able to make work with any 10-speed system. 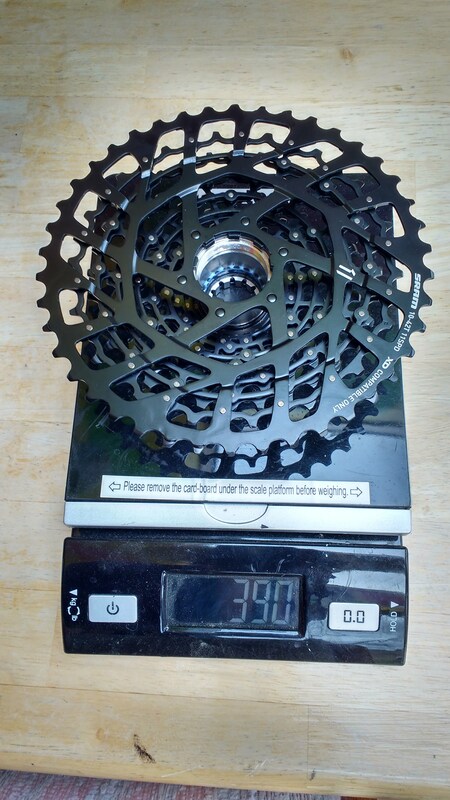 Going all the way to a 50T granny allows you to have a larger front chainring which means you get the massive range for your mid-drive ebike. Although the chain is slightly skinnier and therefore you have a higher risk of chain breakage, and all steel cassettes are a bit heavier than normally sized cassettes, in my opinion, the trade off is worth it. I thrashed on the GX 11 speed setup with an XG-1150 for 2 weeks with a 2500W Ludicrous Christini AWD ebike and this setup did not give so much as a hiccup. When I bent the crap out of the derailleur hanger with a huge stick, the shifting was off, but when I bent it back everything went right back to perfect. I give this setup my stamp of approval and say if I can’t break it, then you probably are going to have a heck of a time breaking it too. Destroy all drivetrains. They are evil and had it coming. I used BBS02 & BBSHD on XG-1195 with XX1 RD & XX1 chain. Riding for nearly 2000KM with no problem. and I seldom shifted under load. The only part got significant decay is the nylon(?) pulley on RD. SRAM got a groupset EX1 which is dedicated for eMTB. and it is non-XD one. 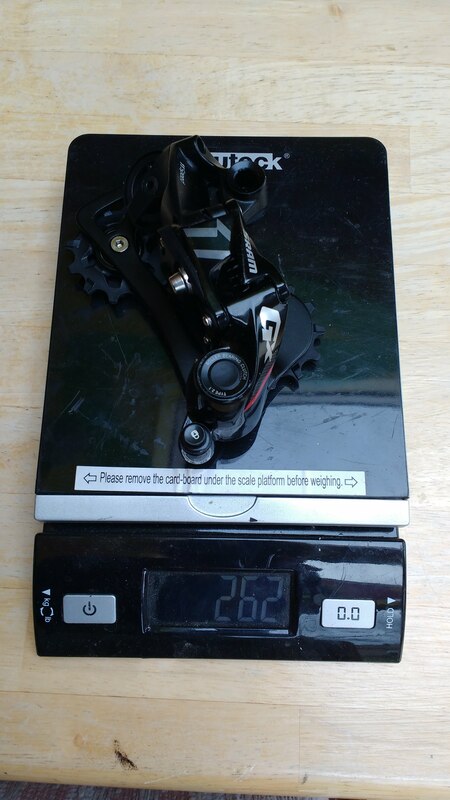 I have been using Ztto MTB 11 Speed Cassette 11-50t Wide Ratio for Shimano m7000 m8000 m9000 Sunrace since November of 2017 http://a.co/0iuk6LA . 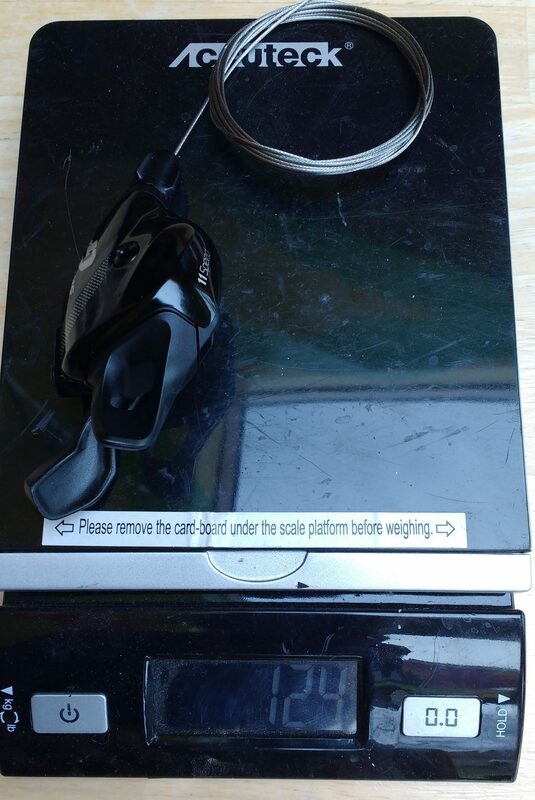 $56 from Amazon or if you are really cheap and can wait for the slow boat from china $48 ebay. It is all steel carrier/sprockets and all the sprockets are connected together. I use it with a Luna BBSHD with the hot rod programing 1500+ watts and a 52v battery. I did not install the Bafang Hydraulic and Disc Brake Sensors E-Brake like I did on my first ebike so it gets shifted under power more often than I like with no problems for many miles on this dirt single track only bike. I am using the Motobecane Boris the Evil Brut Sprung with the Lekkie BBSHD Bling ring 42t. Because the Boris has Vee Tire 4.7 Bulldozer tires (White ones can be had on Amazon for $40 ea right now) make the gearing taller and the stock 42t rear cassette does not work well for my 300lb body. The 11-50t is just right for slow going rocky sections and the SHIMANO, RD-M8000 shadow derailleur with the clutch is the best thing since sliced bread ( It also came stock with the derailleur extender and is about half the price of the GX 1X11). It is a wheelie monster machine for me, I can’t imagine what it would be like for someone who weight 250lbs or less. I did break several free hubs, the steel pawls would get crushed into the aluminum free hub and was replaced buy the manufacturer several times under warranty. I resolved this problem purchasing a DT Swiss 350 free hub that uses ratchet system, far stronger than the pawls system and appears easy to replace the ratchet should you break a tooth (I never have) without having to replace the whole rear hub (which would happen on my old pawl type free hub which would destroy the ring the pawls pushed against and oval the rear hub thus destroying it). Anyway, 11 gears in the rear is a good thing. I think the Shimano system works well, at least for me and my application, I have yet to break a chain. Would it hold up to a 2500W Ludicrous controller? I am thinking it might, depends on the weight of the rider I would think. Maybe you could test it with the Karl Gesslein bicycle drive train wreckin’ machine. Although I understood the risks of aluminium grannies on a mid powered bike, it never occurred to me to consider if the cassette was all in one when used on an aluminium hub. Thank you for this valuable advice, which is suspect will save me from much pain and suffering down the road.